New technology and my bionic hand has opened my life in ways I always dreamed would be possible. “How did your brain injury change you?” was the question of the month. Between sips of coffee and occasional tears, my fellow support group members each took a stab at the question, reflecting on their past and present lives. After years of gathering together in a basement meeting room at our local hospital, we knew each other’s story pretty well. It’s not a coincidence that most of us had been injured as teens. Cliff diving, speeding through the woods on ATV’s without helmets on, drunk driving – we fit the statistic quite well – the one that says risky behavior makes teens more prone to brain injury. As each person spoke, the rest of the group quietly listened, privately remembering the fun-loving, carefree kids that once filled their shoes while imagining how their lives would have been different had they not been so careless all those years ago. I sat silently, too, staring down at the table top, wondering how such a loaded question applied to me. When I glanced up, all eyes were on me. They were waiting for an answer, but I struggled to come up with anything to say. Did my brain injury change me? I wasn’t so sure. See, I don’t really think my brain injury changed me all that much. Unlike the others in the room, I just didn’t remember myself as an easy-going, carefree kind of kid. True enough, my younger days seem ridiculously light in comparison to now. In that respect of the word, I agree with them. And, yes. I was just as fun-loving as anyone else all those years ago. But I was more the kind of kid who was determined to have my way, regardless of whether it was good for me or not. Wanting to do the impossible. Was that such a bad trait? Not necessarily. I will argue that what most teens want, what they strive for, is to take charge of their own lives. They plow ahead with courage and determination, looking beyond the obvious obstacles. Daredevils, all of them – and I wasn’t any different. During the summer of 1986, I was a tenth grader who wanted nothing more than to be on my own. And what better way for a daredevil kind of guy like me to feel independent than to own my own freedom machine – a motorcycle. That was my dream. I had owned mini-bikes before, but this was different. With a full-sized motorcycle, I could take off by myself and drive wherever the air sent me. I was determined to buy one, regardless of the fact that I didn’t have any money. I got a job flipping burgers at the nearby Burger King and saved every penny I could until I found a motorcycle that I could afford. Then I spent hours talking the owner’s parents into letting me buy it for the measly amount I had saved. Fifty dollars. I wasn’t going to take no for an answer, and they knew it. So that afternoon in July, I walked home with my first real motorcycle, feeling as though my day had finally arrived. Yes, I knew I still had to get my driver’s license and a helmet before I could drive the bike on the road. And I knew I had to learn how to handle the bike before I could pass the road test. I should have been cautious, taking it all slowly, one step at a time, but that wasn’t my nature then and it isn’t my nature now. I couldn’t wait to ride it, so I put on the only helmet I had – my bicycle helmet – and took my new motorcycle down to the abandoned railroad tracks, speeding off as fast as I could go. I didn’t see the other kid, a 16 year old just like me, roaring down the tracks, coming at me on his dirt bike from the opposite direction. I’m not sure if he saw me, either. All I know is that we crashed into each other in a head on collision that ironically left both of us with disabling left arm injuries. The chain of nerve cells that runs from the brain through the spinal cord out to the muscle is called the motor pathway. Normal muscle function requires intact connections all along this pathway. Damage at any point reduces the brain’s ability to control the muscle’s movements. After spending three weeks in a partial coma, I woke to hear that this is what happened to me. 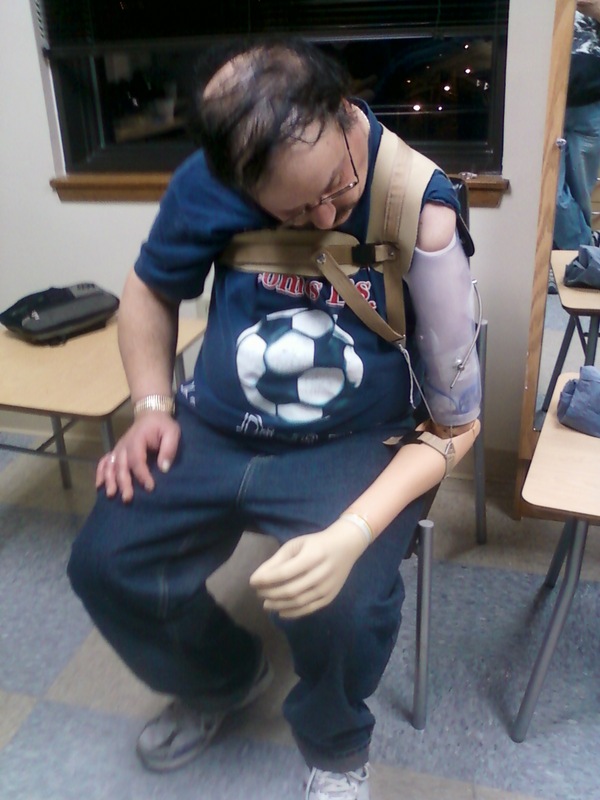 Besides dealing with the usual brain injury problems, I had to learn how to function with one hand while carrying my useless, atrophied arm in a sling, enduring constant pain and pins and needles. Just zipping my coat was a major ordeal and driving was out of the question. Lifting a box or sweeping a floor became near impossibilities. This was my life for the next 26 years. But, here is why I disagree that my brain injury changed me. The fierce courage and determination – the traits that defined my young personality – haven’t gone away with age. I take those traits with me when I use one arm to get dressed in the morning or when I open a can. I use those traits to do jobs that most people do two-handed . And I relied on those traits when I told doctors I wanted my useless arm removed and a prosthetic arm put in its place, making the same request, over and over, year, after year, after year. Even though I was told it couldn’t be done, I persisted anyway, knowing that someday, I would get my way. It was the Anderson Cooper Show that finally changed some doctor’s minds. My girlfriend and I were watching Anderson’s program when he introduced, as a guest on his show, the first civilian to receive a bionic hand. It was a device called the Michelangelo Hand, created by Advanced Arm Dynamics. 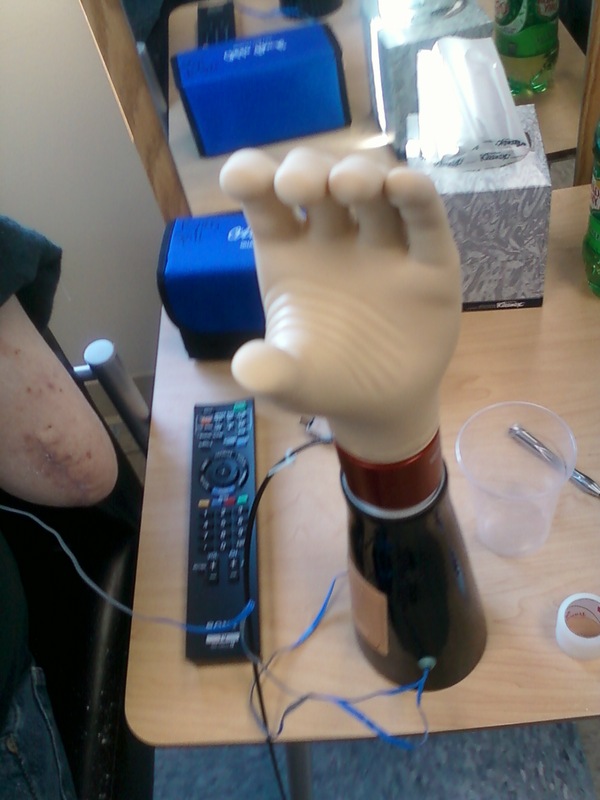 The hand uses electrical signals from the body to operate. When I saw how it worked with such precision, I knew my dream could finally come true. 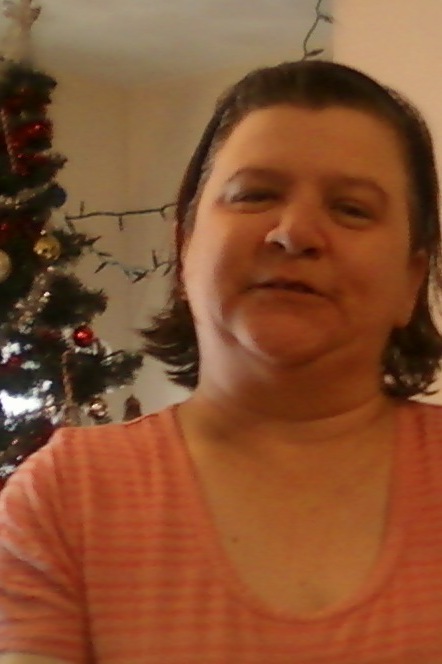 I know I just finished telling you about my stubborn determination, but you should meet my fiancée, Debbie. She just doesn’t take no for an answer! After the show was over, she immediately got on the phone to the Advanced Dynamics Group and asked how she could get a bionic hand for me. The next thing I knew, she had made an appointment for me at The University of Pennsylvania program where I was reviewed. 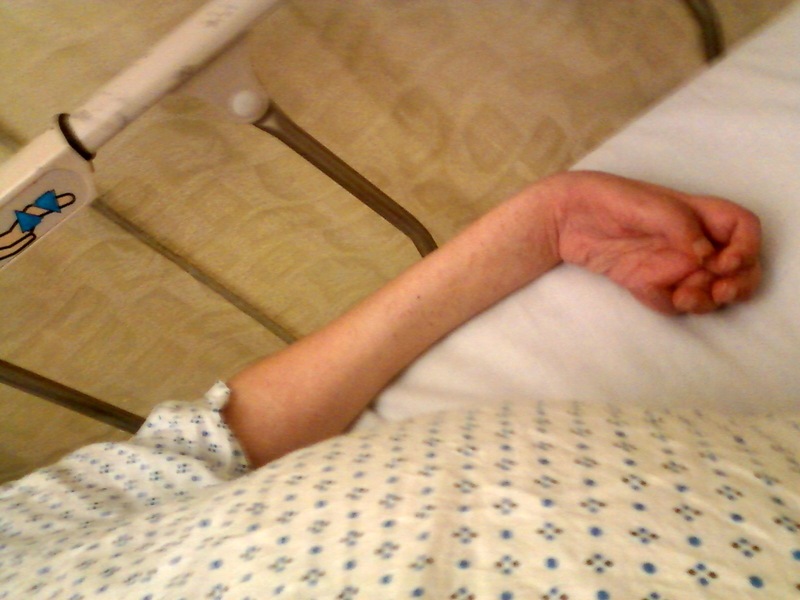 Between July and November, 2012, I received the surgeries I needed to get rid of my chronic pain, to remove my dead arm above the elbow, and to receive my new hand. Now, only a few months later, a light weight piece of metal replaces my useless forearm and attaches to the remaining stump by a plastic sleeve. The device straps around my back and tightens across my chest. It works through nerve sensors so tensing my triceps muscle opens the hand and tensing it again closes it. I have only had my new hand for a few weeks, but already, for the first time in 26 years, I can lift a box, swing a bat and zip up my jacket. 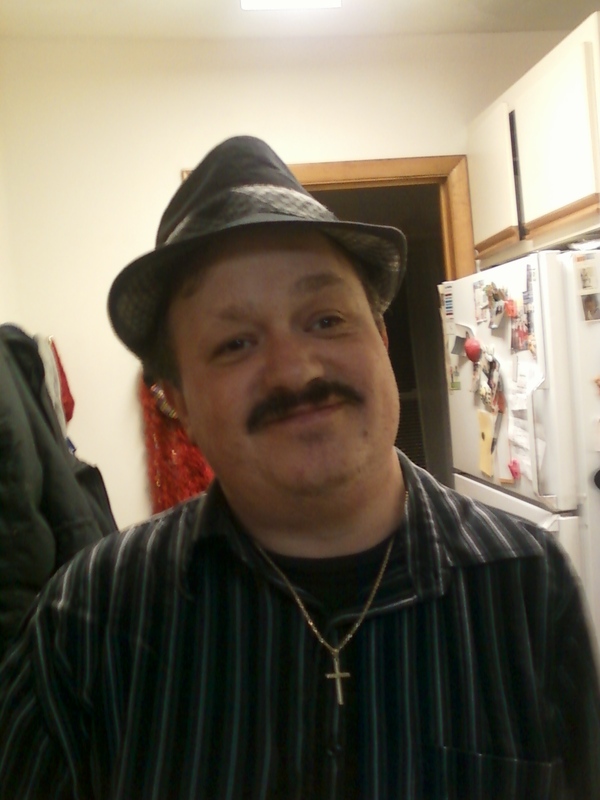 So, to answer the original question, “How has my brain injury changed me?” It didn’t. Yes, it certainly changed the path of my life, but I am still the persistent, determined daredevil kid I used to be. No brain injury can take that away. Advice for Survivors: I would like to give my thanks to the Advanced Arm Technology Program which created this technology for the Wounded Warrior Program. And I would also like to thank all of the veterans for risking their lives and limbs for all of us. I am indebted to you. Thank you, Anderson Cooper, for airing this program. Because of all of you, my life has changed dramatically. For everyone else, if any of you are going to ride a motorcycle, use the right helmet and don’t take off until you have learned, with supervision, how to ride it. With everything else in your life, stay positive, stay persistent, and keep pushing. Advice for Caregivers: Don’t give up. Keep researching because technology is advancing every day that can help with many different problems. There is no such thing as can’t do it. Anyone can do this. Keep a positive attitude, no matter how bad the situation seems. Take it a day at a time – with a positive attitude, all things are possible. Patience and persistence pay off. speed and expanding rider knowledge on operating in varied terrain. So always be alert and watching when they are riding. Always smile and keep your head up and never give up. Thanks for sharing your story, it is very inspiring! Keep up the good work and keep smiling!! Thanks for sharing your story! Keep up the good work!